We are a friendly group meeting every Sunday afternoon; on the 2nd and 4th Sunday of the month we start at 12noon and at 2.00pm every other Sunday through to 6.00pm. 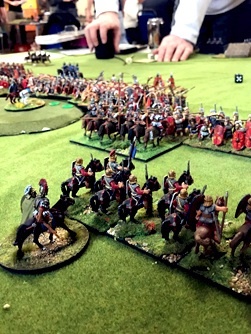 We meet at the Scout Hall, Southbroom Road, Devizes SN10 5AD to play tabletop historical, fantasy and science fiction games, including Warhammer 40K, boardgames and role playing games. Our low membership fee is just £25 a year for adults and £15 a year for junior members or those who live over 20 miles away. The club has a large number of tables available as well as a comprehensive range of terrain for members to use. Each year we host our annual show Attack! and attract many gamers and traders from across the UK. To find out more about the show, click the Attack! link in the index above.